Because BE seems to be forward biased and thus the majority carriers, that is, electrons from Emitter should increase and go into the base and further in collector. The statement of the book is correct. When you increase the base-emitter junction voltage the electron current injected into the base (and thus the collector current) increases but also the hole current injected from the base into the emitter increases similar to an isolated pn-junction. This hole current is usually the dominant cause for the base current flowing into the base. Thus the collector current and the base current increase proportionally to each other when you increase the base emitter-voltage. 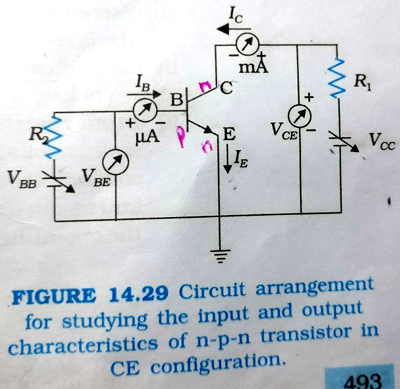 You can take into consideration the formula Ic=Isexp(Vbe/Vt), so obviously if Vbe rises the collector current rises, and if transistor is directly active, you can use the formula Ic=betaIb, so obviously if Ic rises, Ib also rises. You are correct and the book is wrong if interpreted as follows. The emitter majority carriers in an NPN BJT are electrons that are injected into the base. Holes from the base cross the b-e junction and recombine as minority carriers with electrons in the emitter just as electrons recombine as minority carriers in the base with the majority-carrier holes, resulting in base current and finite beta. However, the book is referring to the minority carriers in both emitter and base and as such, they are holes in the emitter and electrons in the base. So both you and the book are right if each is referring to the right currents, minority or majority, in base and emitter. Why Collector-to-Base currents ratio in a BJT transistor always greater than 1?